With the help of our expert team members, we have been able to offer a wide range of Slat Chain Conveyors. 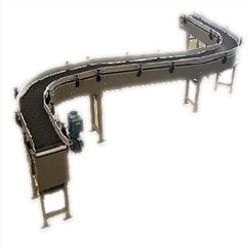 Precisely designed these conveyors are acclaimed for their robustness and consistent performance. Very use full for glass bottle industry, Bottles or tin filling line, Transfering purpose. 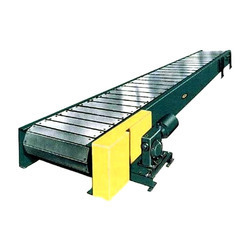 We are the well-known firm engaged in offering a high quality range of SS Slat Chain Conveyors. 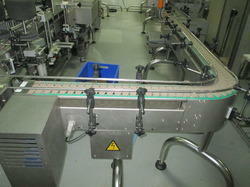 This chain conveyor is inspected on several parameters in order to deliver a defect free range. The provided chain conveyor is available in number of specification as per the needs of customers. Our offered chain conveyor is professionally developed utilizing premium quality material and modular techniques, in conformity with set industrial standard. We have emerged as the leading manufacturer and supplier of a wide range of Acetal Slat Chain Conveyors. 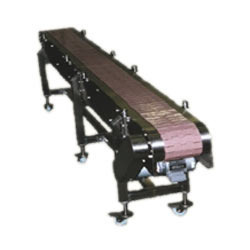 Demanded for its high performance, the offered chain conveyor is manufactured keeping in mind the sett norms of industry using high grade material & contemporary techniques. Customers can avail this chain conveyor from us as per their needs at reasonable prices. Multi Row Slat Chain Conveyors. Backed by the team of experienced professionals, we are able to manufacture and supply Slat Type Chain Conveyors. The offered chain conveyor is developed at our end using finest quality material and modern technology, in fulfillment with set standards. This chain conveyor is valued in the industry due to its performance. We also offer chain conveyor in several stipulations to clientele as per their requisites. Derlin slat chain conveyor for Glass bottle conveyin. 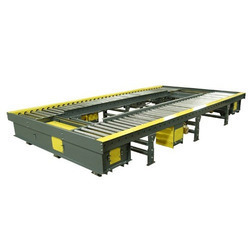 Looking for Slat Chain Conveyors ?